It’s that time of the year again when you need to refurbish your closets with slightly warmer clothes. As the men’s runways showed us, fashion-wise, this season is going to be anything but dull. Normcore is still the ruling the scene and camel and orange hues are catching on quick. Style experts predict silk shirts and corduroy trousers are going to shift gears and go from offbeat to becoming basics. Talking about basics, the obsession with joggers, it appears, is not going anywhere. Men around the world have been adopting this, now a wardrobe essential, from streetwear to luxe. Their new found love seems to be teaming up a pair of joggers with shirts. Especially for the millennial entrepreneurs in India, this combo has become an absolute go-to. It’s not hard to guess why. Entrepreneurs have always loved being different. Even when it comes to fashion. They were never going to be wooed by the confining suits of the corporate world. Joggers and shirt is an ideal pair to allow these high flyers to stay comfortable and relaxed but also lets them make a statement at the same time. Goodbye three-piece suits. Welcome the new business class! Although you love your pair of joggers, you have always baulked at the idea of wearing them to work. It might be time to give this idea a second thought. 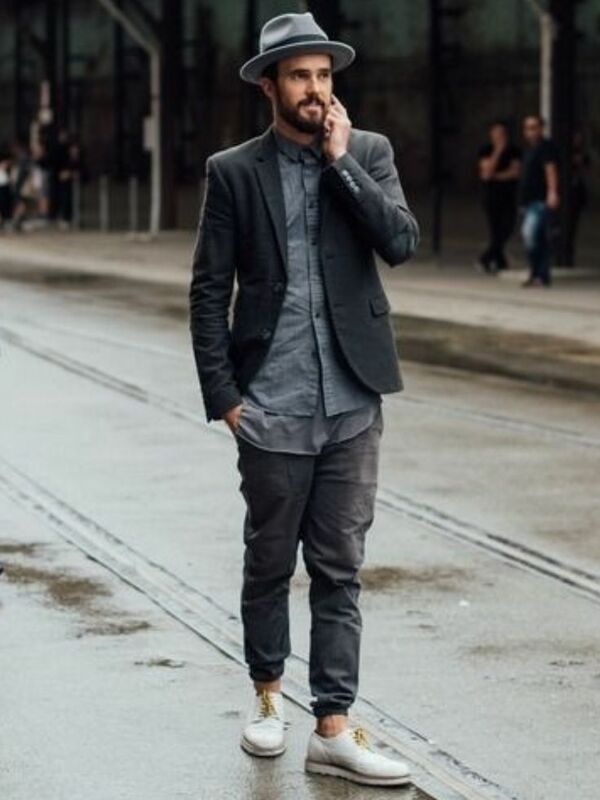 Joggers can provide a great alternative to your usual tailored trousers. All you need to do is know what to match them with. A button up shirt, preferably the reliable Oxford shirt, can easily be worn with slim fit joggers to nail a trendy workwear style. “Slim-fit” — that’s the keyword to remember here as baggy bottoms will spoil your entire outfit. Make sure you tuck the shirt in, because an untucked shirt spells an office disaster even when you’re trying to achieve a smart casual look. You can throw in a well-fitted blazer if you want to. A pair of elegant lace ups or loafers will nicely tie up the boardroom-worthy look. Remember keeping it simple is the way to go. Casual – Not so Casual, Anymore! While wearing joggers to a workplace requires you to follow some guidelines, when it comes to dressing up in joggers for a casual outing, you can really let your imagination run wild. Pick a printed half sleeve shirt if you’re in a fun mood and pair it with either black or grey joggers. If you want a semi-casual look for a date night then a button up shirt in pastel colour will give you a look you can be fully confident in. Note that the bottom of your joggers is sitting tight at or above your ankles. White low-top sneakers are best for a laid back appearance. If you didn’t know already, joggers are also great options for that hiking trip you’ve been planning with the guys. To state the obvious, being full lengths, they’ll protect you from all the hazards one comes across in the woods. The only thing you should keep in mind while planning to buy joggers for hiking is that the material should be made of stretchy breathable fabric that allows movement and doesn’t feel constricted. It also helps if the fabric is quick drying. For a night out that’s guaranteed to be foolproof fun, the first step is to dress right— time to take your joggers out for a bash. You can opt for a classic party look and go for an all-black look. A pair of black joggers, black silk shirt, a velvet tuxedo jacket and a pair of polished derby shoes will give the boring old party wear a whole new spin. Another way to achieve a refreshing night out look is by combining your joggers with a crisp white shirt, a neat little tailored waistcoat and Chelsea boots to finish the look. If you’re feeling experimental then a maybe a fedora hat is just the addition you need to this outfit. So how do you plan to wear your joggers this fall? Share your style ideas in the comment section below.